Never has the background music been so loud that I wanted to run out of the theater because my ears could take it no more. Had I been able to get over that, I might've enjoyed the film for what it was trying to say. Even so, how it said the message and the baggage of righteousness it carried would have been a hindrance. Hindi movies are repetitive and predictable. And yet they manage to surprise you. 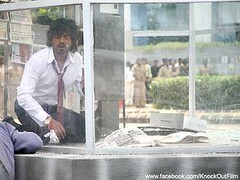 Knock out actually managed to get an awful performance out of Irrfan Khan. Yep! Disheartening, no? At first, I thought it was his ridiculous hairstyle I aren't being able to distract myself from. But, with the passing minutes it was difficult to let the haywire curls shoulder all the blame. While watching Irrfan Khan deteriorate, Sanjay Dutt's usual stylish, confident, goon act seemed like an award-winner. Kangna Ranaut? Oh, you mean her shrieks, weird dialogue delivery mechanism aka her pout? I just wanted her to go back to her drugged out, mentally ill characters. In fact, looks like she was missing those days too. She tried to pull one of those looks off, in a scene where she's supposed to be scared. After all of this there is only so much Sushant Singh's cool atitude can pull off? Also, one of the other main characters, the phone booth was way too lavish to portray the character's internal struggle or the claustrophobia he feels because of the person he is. Despite all of this, I'd say Knock Out is far better written than your average thriller. With any fiction, there still is a realm of reality within which the story should/or at least try to stay. The way around this, is ofcourse to spread the acceptability sphere so wide, that almost anything is possible from within. So, the whole world is at Sanjay Dutt's disposal. By definition, his act is so well planned, that you cannot question his capabilities of being ready for almost anything. When you cannot question the character's capacities, all you are left with is the bare bone plot. Knock out had a strong-ish hold on that one till they gave way to all of mother cliché's children. The spiels wouldn't stop and to ace it, you had one character actually say, "I haven't called you to preach!". Yeah, right! Yet, Knock out covers a lot of ground. It touches upon the cool aloofness of the CCD-generation towards bomb-blasts and such everyday happenings, till something completely out of the ordinary happens - like a suited-guy does a ridiculous dance in the middle of the road. It goes on to show how self-centered we are in our roles - whether we are news reporter or a police officer. We want to keep control, irrespective of the life-and-death situation at hand - as long as it is not ours. This becomes clearer when a direct question is posed "my career vs. nation's future" The character chooses the latter and you go 'baah!' Which is when I realized how truly self-absorbed we are when we cannot even accept our fictional characters giving up on personal aspirations. Yet, towards the end I was thinking. So, what if, what happens in this film actually comes true? What will we as a country do about it? How will we as citizens hold the new people in-charge accountable? Now, when a movie has made you think that one bit about the topic it's about, it has done something right, even if it is a teeny-weeny bit. Tony (Irrfan Khan) is an investment banker with more suspect investing practices and clients than one can imagine. He's trapped in a phone booth by an unknown person. No one knows why. The fact that we didn't know what the real deal with the character, Bharati was? The fact that the story clearly shows that Tony was the most vulnerable person in this chain of corruption and thus chosen. The whole deal about Tony being accused of the murder who was facing Tony but was shot from the back! Why were there newspapers in a phone booth!? Concept: Wiping out corruption in one clean stroke. General Look and Feel: One location, more or less.